Includes CRMX (embedded CPU) with 3 GE switched LAN ports and 1GE WAN port, OSN Server (V2) with 1GB RAM, HDD with BroadSoft's PacketSmart agent, and single AC power supply. Supports VoIP gateway functionality, basic routing (static routing, RIP v1/v2, VLAN) and basic security package. This product is end-of-life and limited quantities are available. Existing installed base will be supported by AudioCodes up to software Version 6.6 (SIP protocol based). This product has been replaced by the Mediant 1000B. This product is end-of-life and limited quantities are available. Existing installed base will be supported by AudioCodes up to software Version 6.6 (SIP protocol based). This product has been replaced by the Mediant 1000B. 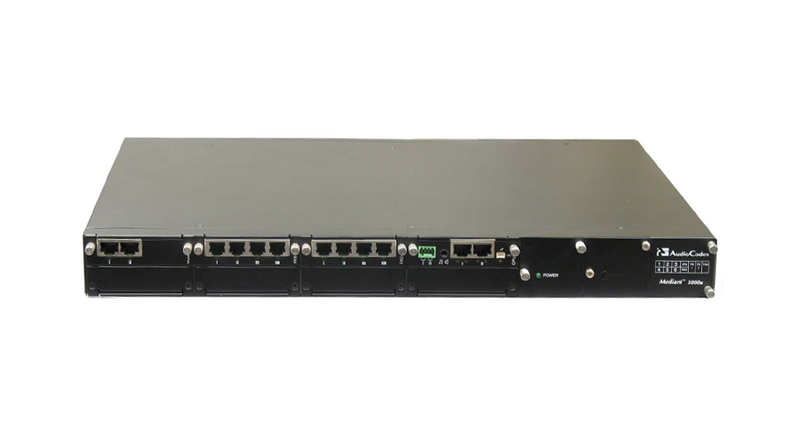 Includes CRMX (embedded CPU) with 3 GE switched LAN ports and 1GE WAN port, OSN Server (V2) with 1GB RAM, HDD with BroadSoft's PacketSmart agent, and single AC power supply. Supports VoIP gateway functionality, basic routing (static routing, RIP v1/v2, VLAN) and basic security package.